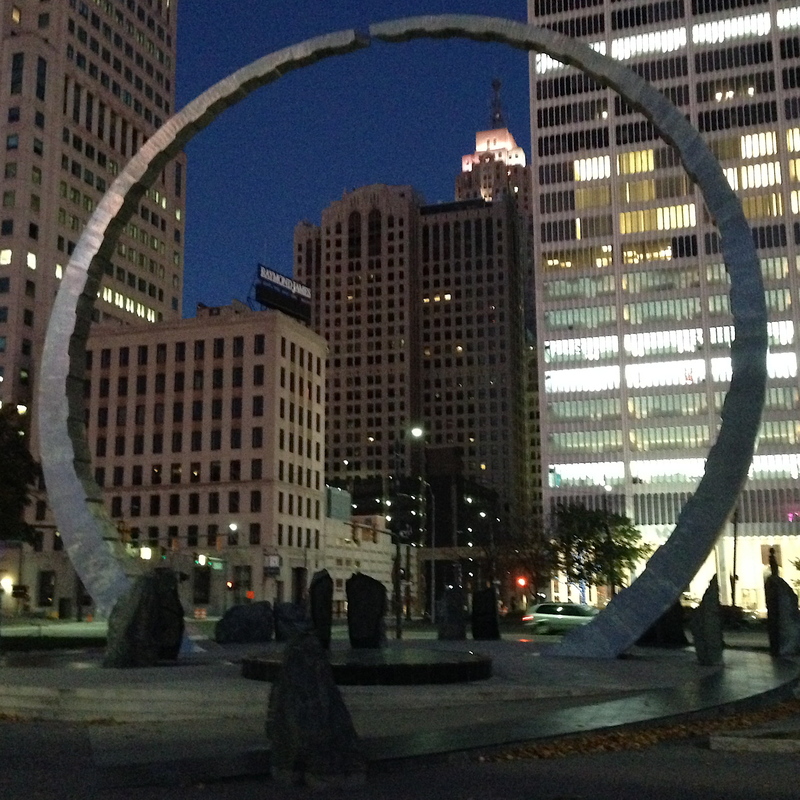 Detroit is a magical city in the early morning just before sunup. The tall office buildings are mostly dark, but a few of them had an occasional lighted office suite that was glowing in the darkness. The glowing suites were generally located well above the street. The office lights cast subtle shadows and highlights that seemed to enhance the design of the building. The indirect lighting cast from the upper floors also created low, ambient light on the streets below. Looking south across the Detroit River to Canada, the bright neon lighting of a casino lit the sky, much like a beacon or a mythological siren luring customers through their doors. 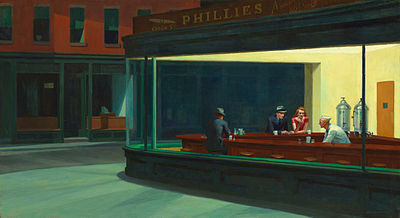 The bright neon lights were also reflecting on the calm, non-rippling water of the river that was gently sliding south. 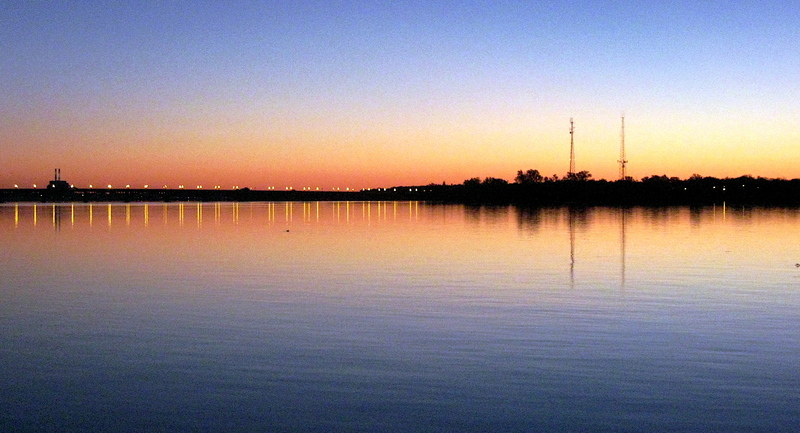 As I rode out to Belle Isle that morning, the sun slowly rose to the east. 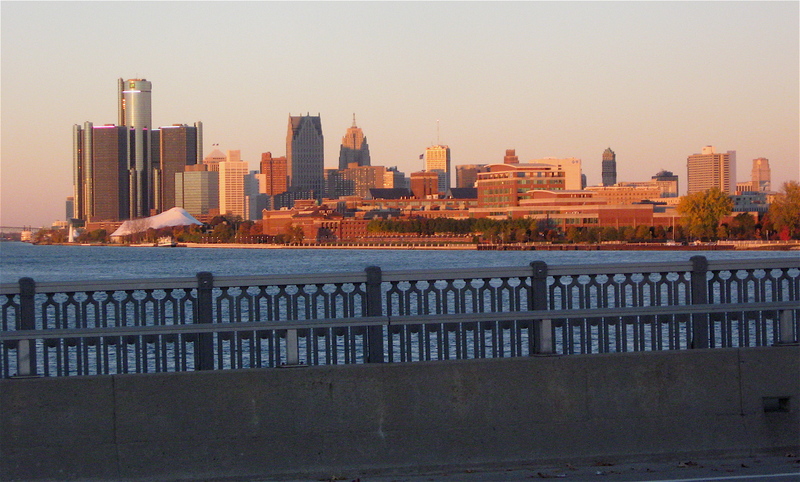 When it broke over the horizon, the city’s skyline took on a golden hue, as if to welcome a bright, new morning to Detroit. 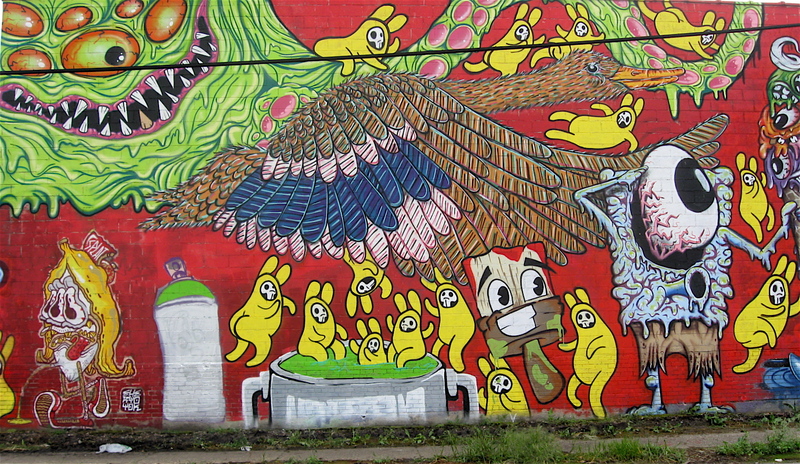 There is an old, historic industrial neighborhood on the city’s northeast side called Milwaukee Junction. It was established in the late 1890s as a manufacturing hub. It’s a place where a series of railroad junctions all came together in support of the expanding automobile manufacturing industry. In that area is an old four-story, unassuming, brick factory that has recently gone through a huge change. 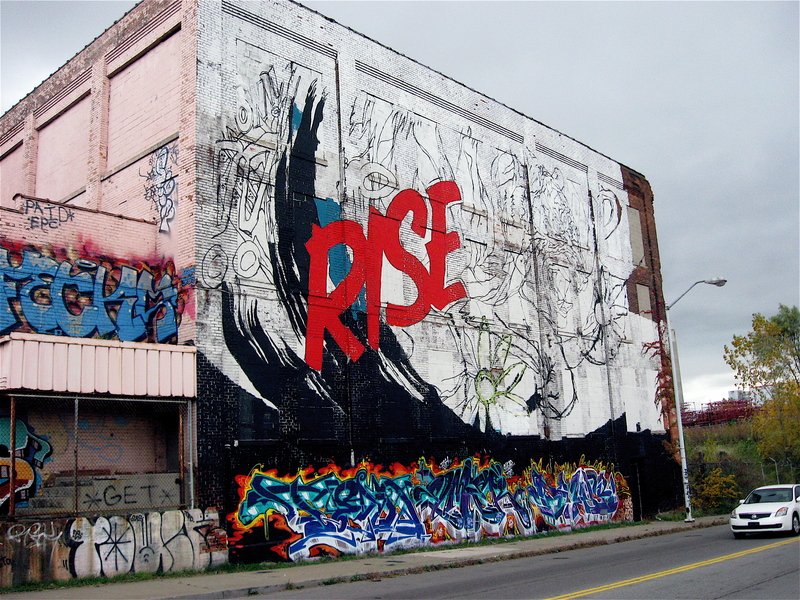 Rise Up is the largest piece of wall art MEGGS he has ever taken on, and it’s probably the largest in the City of Detroit. 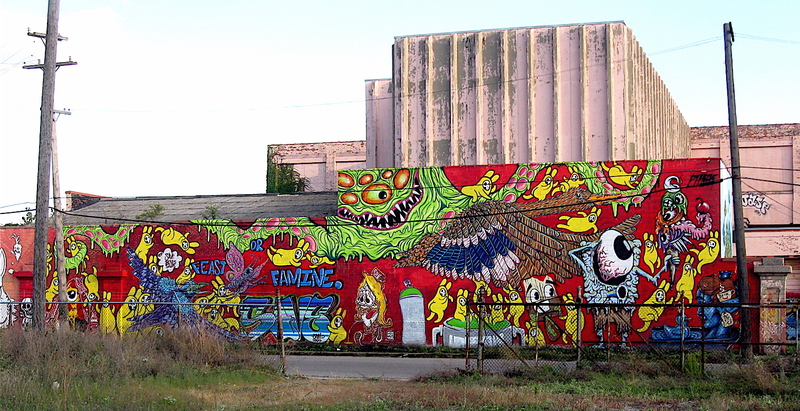 The amazing, colorful, highly detailed mural covers over 6,000 square feet of wall space. It spreads across four stories of the old factory wall. 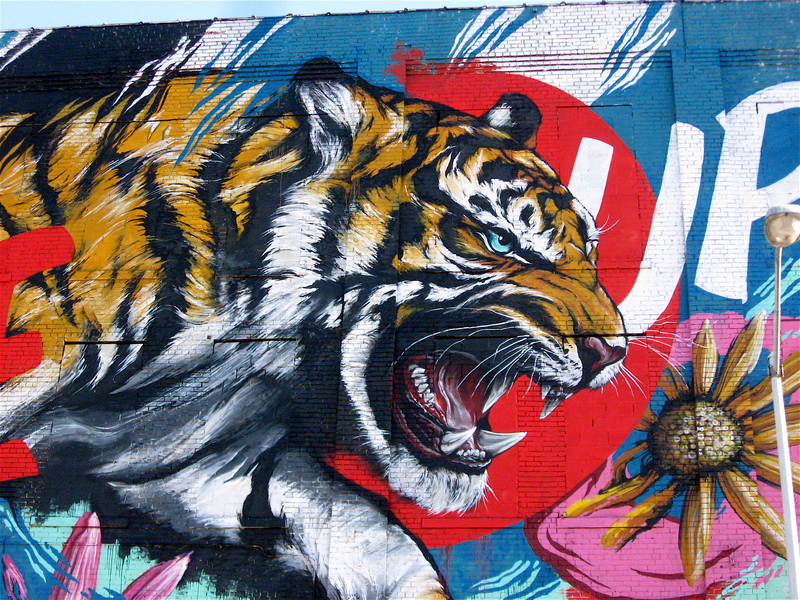 A major focus point of the artwork is a huge head of a tiger. The head is two stories tall, which equals at least 30’ in height. 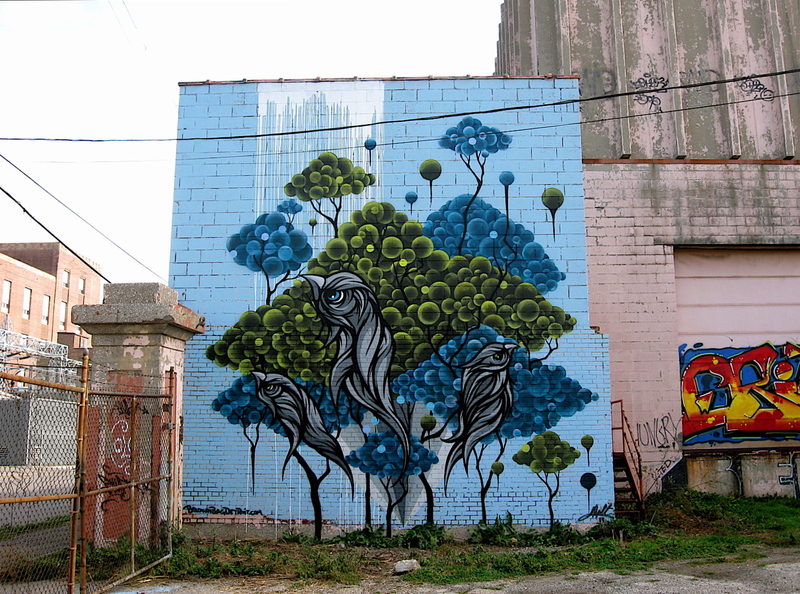 I was fortunate to discover this piece on Russell Street at Trombly while MEGGS was working on it in its early stages. At that time the content was being sketched out on the brick wall. Watching the progress, I was amazed at the speed in which this giant piece of art was created. He managed to sketch it out and complete it in about 10 days. I caught the early stages of the mural around October 17th and was blown away when I saw the final, completed piece on October 27th. Considering the size of the project and the limited reach offered from a mobile lift MEGGS was working from; the scale, proportion, and use of color are incredible. 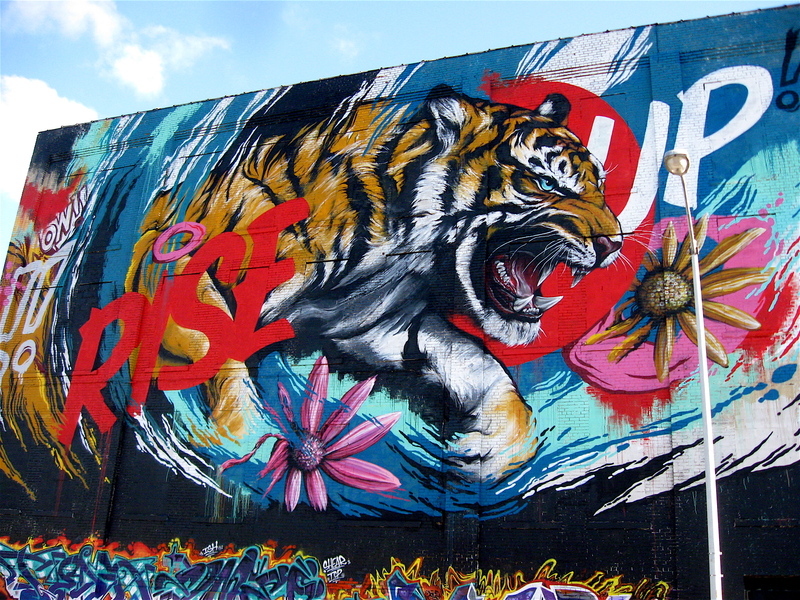 I don’t understand how the street artists can create something of this magnitude with a few rollers and paint from spray cans, but it is impressive. I also like the pieces along the base of the wall, just below Rise Up. 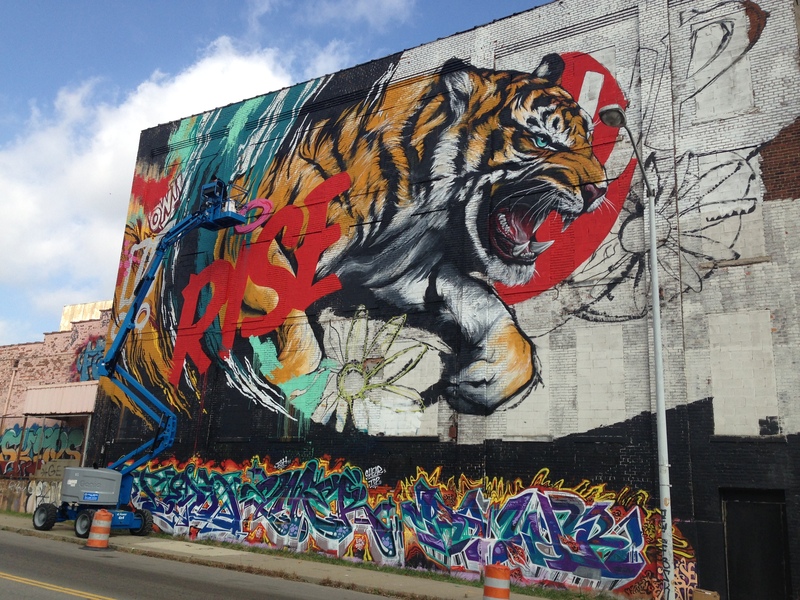 They are the work of Detroit graffiti artists Tead, Elmer and RAWR. 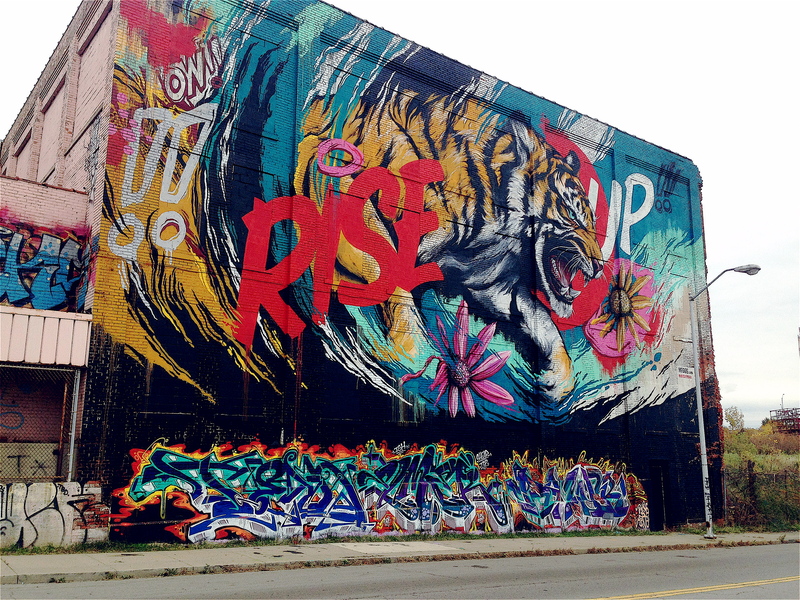 In a recent social media posting MEGGS describes the Rise Up piece as “an iconic symbol of the city and past glory for over a century, it is now a symbol of future hope; to rise up against great odds”. Beautiful!